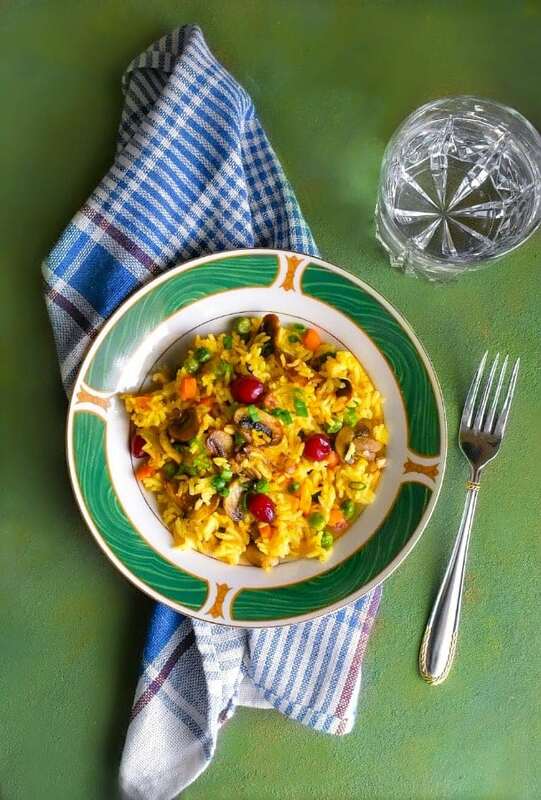 One Pot Mushroom Pilaf: delicious, flavorful and hearty one-pot recipe that’s loaded with veggies and ready in 20 minutes. Can be stored in the fridge for up to 2-3 days. It’s vegan and glutenfree. 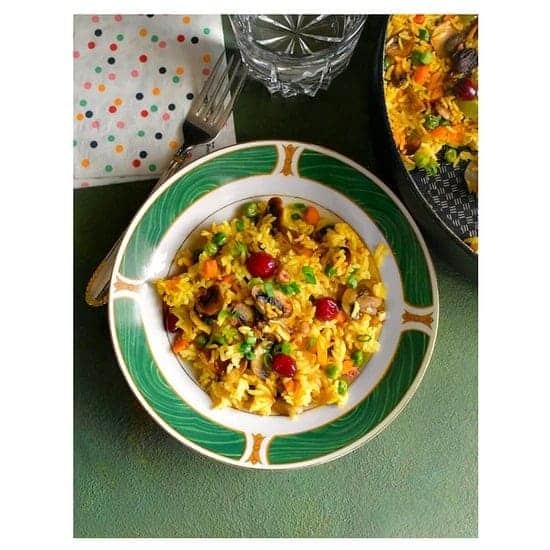 This Easy One Pot Mushroom Pilaf is an absolute winning recipe among our family and friends. I can make it anytime and they would happily devour every bite of it. It’s also one of the recipes that have turned many of our friends into complete mushroom lovers! 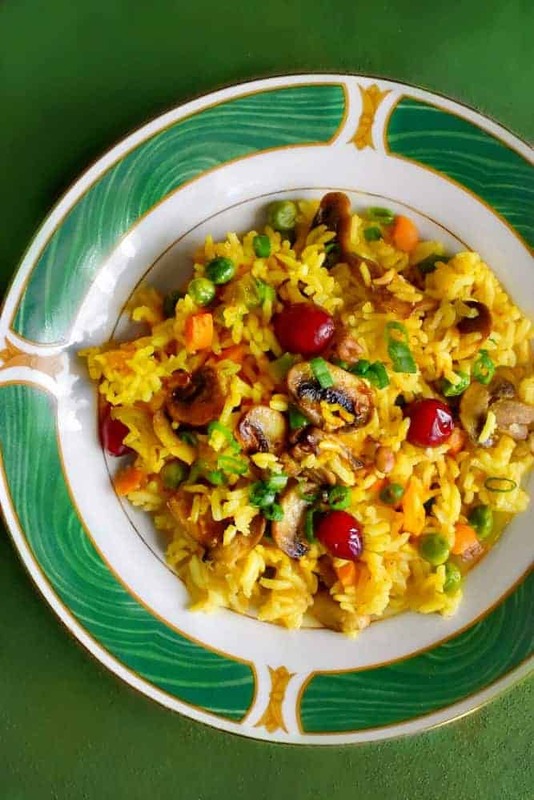 This combination of mushroom with veggies, spices, and rice is absolutely made for each other and if you have never tasted it, then you need to leave everything and make this ASAP! It’s a super easy, one-pot recipe that’s excellent for hiding veggies from your picky eaters and makes great office lunches too (just heat & eat). There’s one more reason, why it’s our favorite and that is – it’s made using USA Rice / U.S.- grown rice and incorporates local produce to support our local farmers. 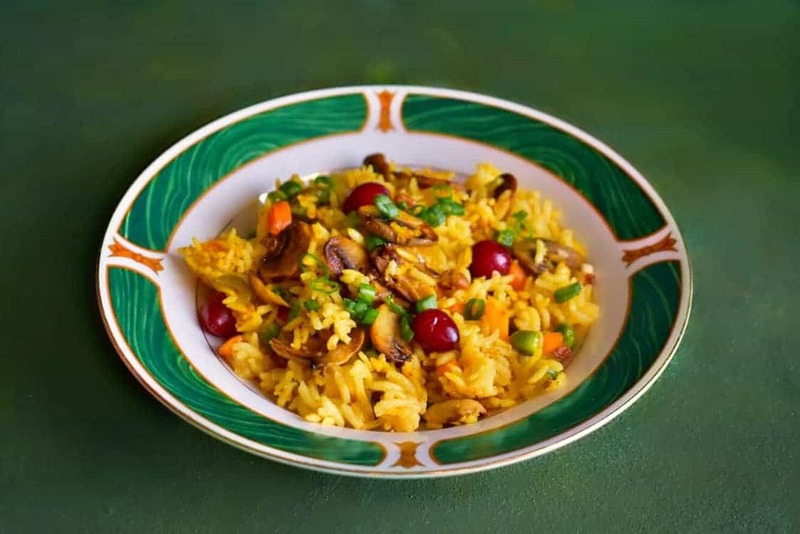 Now, before we go ahead with the recipe of this One Pot Mushroom Pilaf, did you know February is also American Heart Month? I mean we do celebrate Valentine’s Day but it’s wonderful having a whole month to remind our special one, family/friends, to commit to a better heart health by incorporating healthy lifestyle/eating habits. Has more than 15 essential vitamins and minerals including, folic acid, B vitamins, potassium, magnesium, selenium, fiber, iron, and zinc. It’s just 100 Calories per serving and keeps you satiated for long. Contains just a trace of fat, no sodium, cholesterol, saturated or trans fats. That to me is a total WIN-WIN situation in terms of meal, health and budget. 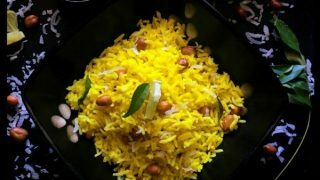 Also, one very important fact to remember – Rice is gluten-free, highly digestible and the least allergenic of all grains, making it an important grain option for a gluten-free diet. 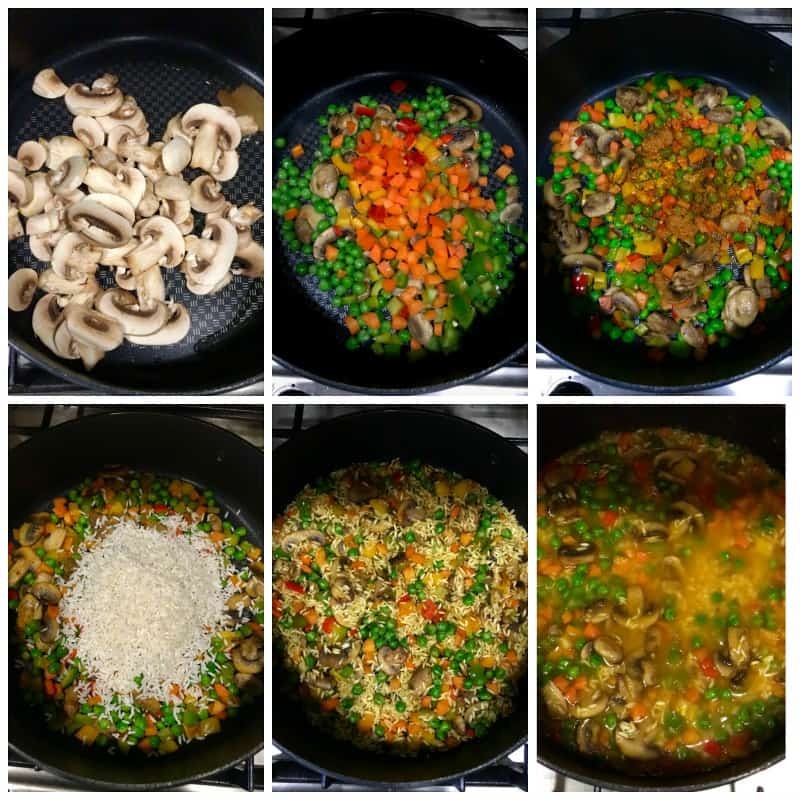 Now, let’s get started with our yummy One Pot Mushroom Pilaf and I’m literally making it into one ‘Eat the Rainbow’ kind of a meal. Which simply means adding as many natural color produce in our diet which comprises of multiple ‘vitamins + minerals + antioxidants’ which in turn makes our heart even more healthy and happy! And by adding rice and spices, we just added more benefits to the meal. Here’s an Important Fact about Mushrooms: They are an excellent source of naturally produced Vitamin D and antioxidant. However, they need to be cooked to get their nutritional benefits as their cells walls are indigestible unless exposed to heat. 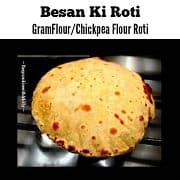 The recipe is extremely easy, seriously you don’t have to stand in front of the stovetop for longer nor need 2-3 utensils. One pot to make and the same pot can be used from stovetop to serving too (saves you many heavy/extra utensils to wash). You just need to sauté the mushrooms, veggies first, then add spices, then rice and finally water. That’s about it, just leave it covered for 12 minutes over medium heat and your hearty meal is ready. 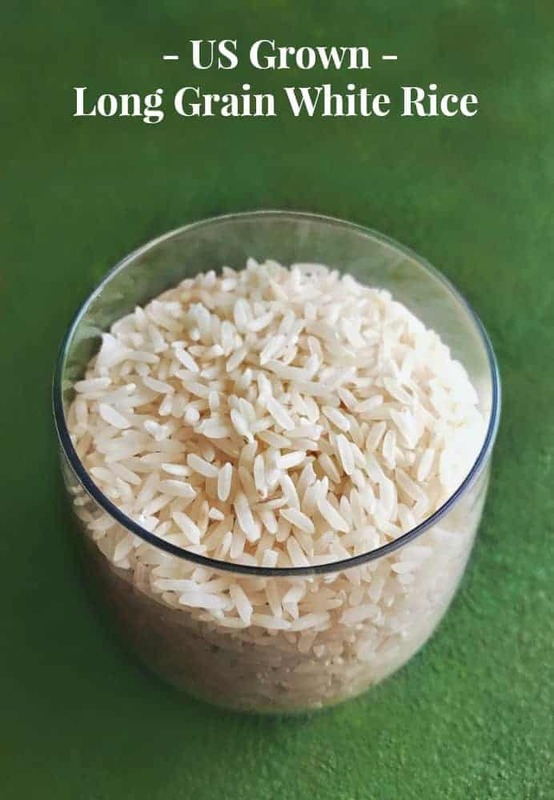 One more reason for using U.S.-grown long grain rice is their starch composition, cooked grains are lighter, fluffier and more separated, which makes them an excellent choice for pilaf’s/gumbo or other such recipes. stand out and that to me is a restaurant looking meal at home. I also added some fresh cranberries and chopped pecans on top but it’s completely optional. 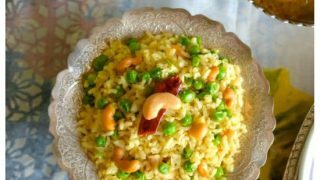 The combination of veggies used with long grain rice, gives it a beautiful color and taste, however, you can add or remove any vegetable as per choice. Also, I did not use any special broth/stock to make this pilaf. The sautéed vegetables and spices give it so much flavoring that plain water works best here (for cooking). 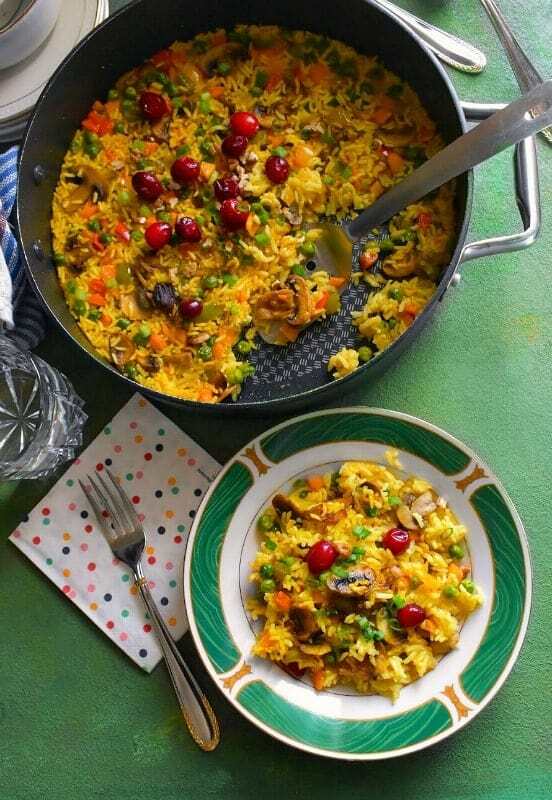 Before, I go and enjoy this heart healthy One Pot Mushroom Pilaf with my family. 21% reduced the risk for metabolic syndrome. the American Heart Month by incorporating habits to improve heart health today and forever. 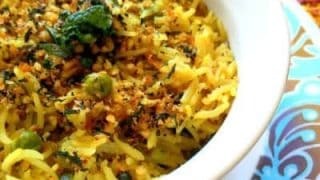 One Pot Mushroom Pilaf: delicious, flavorful and hearty one-pot recipe loaded with veggies and ready in 20 minutes. Store in fridge for 2 days. Add all the pilaf seasoning ingredients in a grinder and pulse to form a fine powder. Heat olive oil in a non-stick pot. Add bay leaves and saute. Add mushrooms and saute for another 2 minutes till they get brown. Add all the rest of the vegetables and saute for 2 minutes on medium heat. Now add add 1.5 tsp pilaf seasoning and saute everything evenly. Finally add rice and saute (with a light hand) for 2 minutes (cook rice slightly). Then add water and cover the pot with lid. Lower the heat and let this cook for 12 minutes (check in-between to make sure nothing burns as all stoves are different). After the rice is cooked, turn off the heat. Sprinkle with some fresh cranberries, scallion and chopped pecans (completely optional). 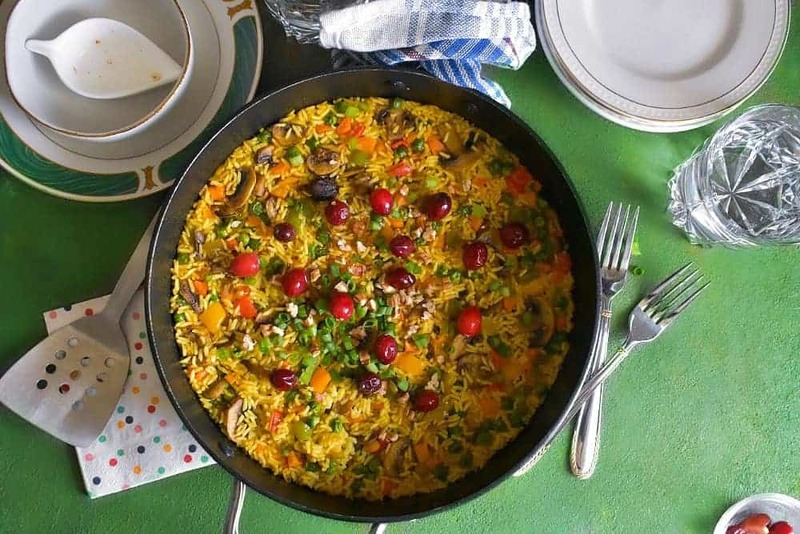 12 Replies to "One Pot Mushroom Pilaf - Video Recipe(Vegan + Glutenfree)"
This looks amazing. Before I make I do have a question for you. I usually use 1 cup rice to 2 cups of water ratio. Your recipe is calling for 4 cups of water, is this accurate? I just want to make sure. Thank you! 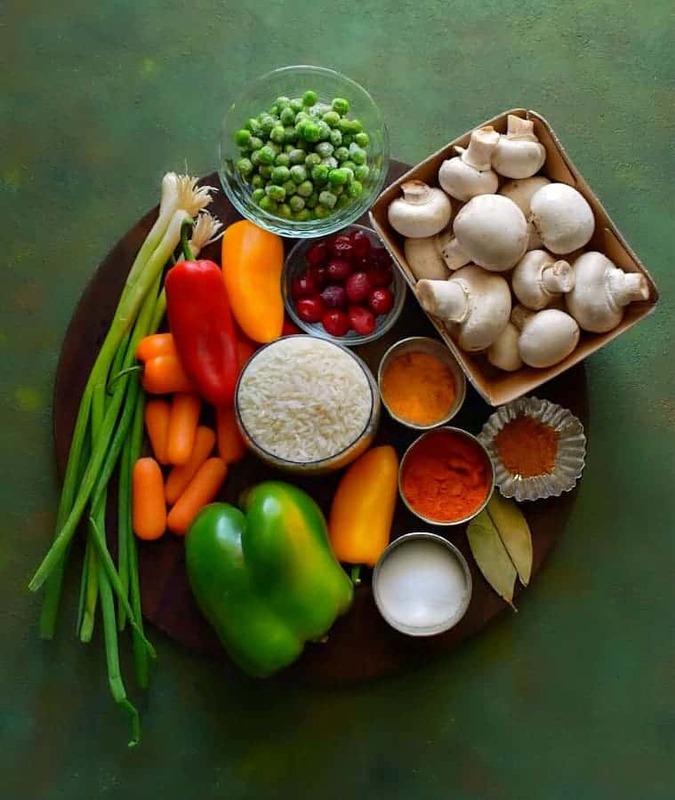 Hi Natalie, Thanks for your message and yes, you need only 2.5cups water with 1 cup rice + all these veggies. If you like the rice a little less starchy, you can reduce the water to 2 cups too. There was an error and it’s been corrected – Thanks. 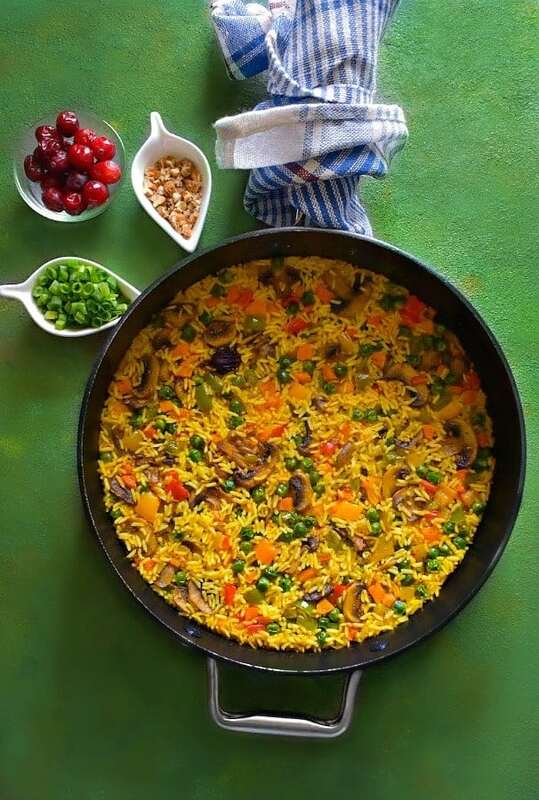 Wow your one pot meal looks so inviting and I love that texture! 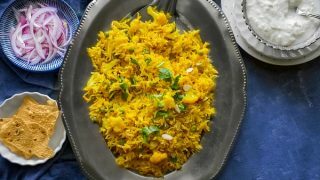 Pilaf is such a delicious, comforting dish, and it seems like every family has a recipe that is uniquely their own. (My favorite so far is from one of our Russian grandmas.) I love how vibrant yours is – the fresh cranberries add a nice, bright pop of color. 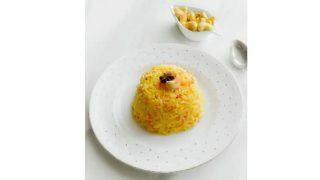 Oh my, this pilaf looks so rich and delicious! 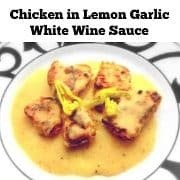 Such a great idea for a main course on weekend dinner or lunch. 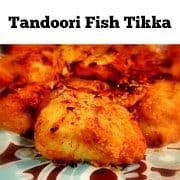 Will definitely try this recipe soon! This looks seriously delicious. 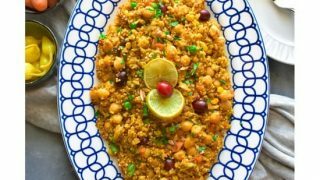 I’m always on the lookout for healthy one pot meals so will definitely try this! Love all the health info in this post too! I had no idea that mushrooms needed to be cooked to get the nutritional benefits. Molly this rice looks incredible! I love all those toppings to add more texture to the dish. 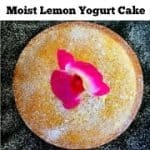 I am a big fan of all your recipes you really have amazing ideas and pictures. 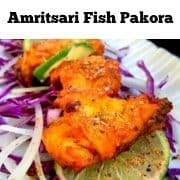 Now I am really hungry!